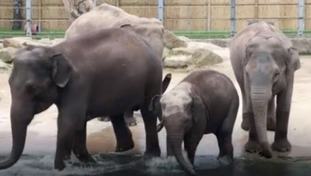 Twycross Zoo no longer has its herd of four female elephants. The final two were moved to Blackpool Zoo this week, to join the other two which were moved earlier this year. The announcement was made last November when the zoo said it was the only way to allow the herd to breed and grow. The decision to move our elephants was not taken lightly; we carefully assessed all viable options for our herd, but as Blackpool can now boast to have one the best elephant facility in the UK, this was really the best option. Tara and Minbu travelled north separately earlier this year, with 22-year-old Noorjahan and four-year-old Esha travelling together and arriving at their new home on Tuesday. Footage filmed by Twycross Zoo shows Noorjahan and Esha in their new enclosure. It’s been a very emotional time for the Twycross Zoo family. Moving four elephants safely across the country has been a real challenge for our keeper team, all dedicated to making the transition as smooth as possible for our girls. By getting used to standing in them, the zoo hoped their journeys north would be less stressful. Elephants have been at Twycross Zoo since 1964, but Asian elephants are endangered with populations declining by at least 50% in the last three generations. By moving Tara, Minbu, Noorjahan and Esha to somewhere where they can breed, its hoped the species will grow.